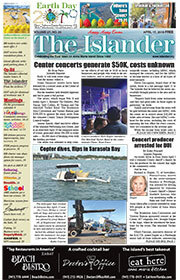 Fishing around Anna Maria Island remains consistently good for a variety of inshore species. Fishing deep grass flats with good tidal flow is producing rallies of spotted seatrout. Live shiners free-lined or under a cork are the bait of choice. Determination is key to finding slot-size fish due to the vast amount of under-sized trout inhabiting the flats. Rallies of 30 trout or more are not unheard of, but you may only catch a few fish in the 15- to 20-inch slot. Mixed in with the trout are mackerel and ladyfish, to add variety to your catch. Mangrove snapper are in abundance in our local waters. Whether you’re fishing the nearshore reefs in the Gulf of Mexico or in Tampa Bay, you should come across these feisty little reef dwellers. I’m even seeing them on the grass flats. Deeper grass areas, where fry bait is present, are good places to look. And if you’re having trouble getting the snapper to bite, try scaling down your leader and hook size. I’m using 15-pound fluorocarbon with a No. 4 size circle hook. You can go lighter if you like, but the 15-pound fluoro seems to be working well. 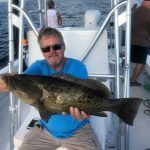 Lastly, if you’re looking for something exotic to catch, you may want to venture toward the mouth of the Manatee River. While fishing morning low tides, I’m seeing dozens of gar cruising the flats around the bulkhead. Gar are a freshwater species, so we normally don’t see them in the bays. This being said, I think the vast amount of rain in East Manatee is forcing the Manatee River to flush more freshwater into Tampa Bay than normal. This abundance of fresh water flowing from the river pushes farther into our saltwater fishing grounds. Places to look are the southern shoreline of the Manatee River from De Soto National Memorial to Robinson Preserve. These gar are curious, so a number of baits will work, including shiners, pinfish and cut ladyfish. Jim Malfese at the Rod & Reel Pier says pier fishers using shrimp as bait are finding success on a variety of species. Mangrove snapper, sheepshead, flounder and black drum are being caught with some regularity. Morning outgoing tides are resulting in the best action. Those anglers working with live shiners as bait are doing well on mangrove snapper, Spanish mackerel and catch-and-release snook. Casting artificials such as Gotcha plugs or silver spoons is attracting attention from Spanish mackerel, jack crevalle and ladyfish. Capt. Aaron Lowman is working the nearshore structures for mangrove snapper. Chumming the snapper to the surface and then free-lining baits to the target is most productive, although live shiners on a knocker rig will also work. While targeting snapper, Lowman is encountering flounder, gag grouper and Spanish mackerel. Snook fishing on the flats also is producing a bite for Lowman’s clients. Free-lined or under a popping cork, live shiners are working as bait for the schooley-sized snook. Although they are catch-and-release, these linesiders produce great rod-bending action for sporting anglers. Capt. Jason Stock is in pursuit of tarpon along the beaches of Anna Maria Island, where live crabs or pinfish cast to cruising fish are producing a bite. Catches are ranging 80-140 pounds with larger fish mixed in for lucky anglers. Moving offshore, Stock is working structure at the wrecks and reefs. 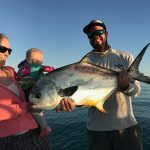 Around the wrecks, permit are a good bet. As far the reefs go, mangrove snapper, gag grouper and Goliath grouper are coming to the hook. Capt. Rick Gross of Fishy Business Charters is finding his share of mangrove snapper on nearshore and inshore structure. Artificial reefs in the Gulf of Mexico, as well as in Tampa Bay, are producing good numbers of snapper during morning tides. Snapper are being caught on deeper flats adjacent to channels, where good tidal flow is present. Catch-and-release snook fishing is providing great action for Gross’ clients. Schooley and slot-size snook are being hooked on live shiners fished under a cork. Mangrove edges during high tides are the best bet. Capt. Warren Girle is looking offshore for his share of mangrove snapper. Snapper 15-20 inches are being taken on live free-lined shiners or knocker rigs baited with shiners. While targeting snapper, Girle is catching red and gag grouper, as well as an occasional cobia. In Sarasota Bay, Girle is casting into the deep grass flats for spotted seatrout. Numerous trout are being caught during moving tides in depths of 5-8 feet. While targeting trout, expect to hook into ladyfish, bluefish, macks and jack crevalle. Capt. David White of Great White Charters says the morning spotted seatrout bite has been really good. White has been putting clients on fish up to 22 inches on the deeper flats by focusing on the schools of pilchards. He says to toss out a live one under a popping cork for almost instant results. Mangrove snapper are fired up everywhere and White hasn’t had to go far to find 15-inch fish. Free-lining dead shiners back onto structure seems to be the ticket, according to White. Using a light leader is key, as the fish can be finicky, but tossing out a handful of dead bait from time to time keeps them fired up, he adds. The nearshore reefs are producing a lot of Spanish mackerel for White’s Great White Charters They’re good for peeling off some drag. Long-shanked hooks with live shiners is White’s method to target these high-activity fish. At night, White’s been getting a lot of snook on fly. With ladyfish in between as practice, catching these fish on a 6-weight fly rod is as fun as it gets says White — for those ready to stay up late and fish with less heat.